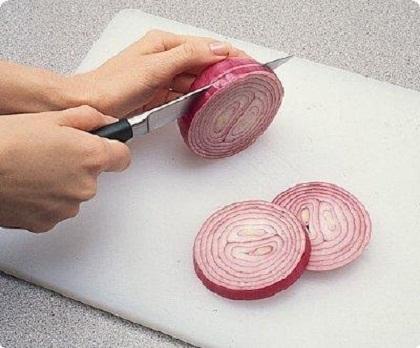 Onion can produce amino acids and when we cut the onion, Propanethial S oxide is released. This substance has the property of evaporating easily in the air and it irritates the eyes. The moisture in the eyes and this substance are mixed to form hydrogen sulphide. And so we get tears in the eyes and water from nose also. The substance which results in tears would give good smell while frying the onions. So in order to get prevented from tears while cutting the onions, we need to soak them in water for few minutes.